The Complete Cosmicomics is a collection of short stories, which all have a slight basis on one scientific fact and then Calvino weaves a story around it. There were quite a few really enjoyable ones, for example “The Light-Years” and “The Dinosaur” were two of my favourites. “The Light-Years” is about how one night the narrator looks through his telescope and sees a sign hanging on a galaxy that says: ” I saw what you did.” Naturally, since the narrator has been present since the beginning of time and the galaxy he was observing is two million light years away then some-one observed him that long time ago. And now the narrator is trying to justify himself in a way, or just leave a better impression of himself, but now there are signs springing up in other galaxies as well and it seems to get quite embarrassing for the narrator, as he can’t really hide himself and fix the impression other beings have of him, because the light gets there so slowly…Anyway that story was fun. “The Dinosaur” however is about the last poor dinosaur who has to come to grips with living in a world with “the New Ones” who are taking over the world and telling scary stories about what awful monsters dinosaurs were not even realizing that by chance there is one living among them. It is rather sad and imaginative and makes one feel bad about the extinction of the dinosaurs and about the fact that the silly “New Ones” think that rhinos are dinosaurs…. There were a lot of other stories, some of which were just a bit too difficult to get through and not fall asleep at the time, others were really good, so despite only 6 points out of then I’d recommend reading at least some of those stories! 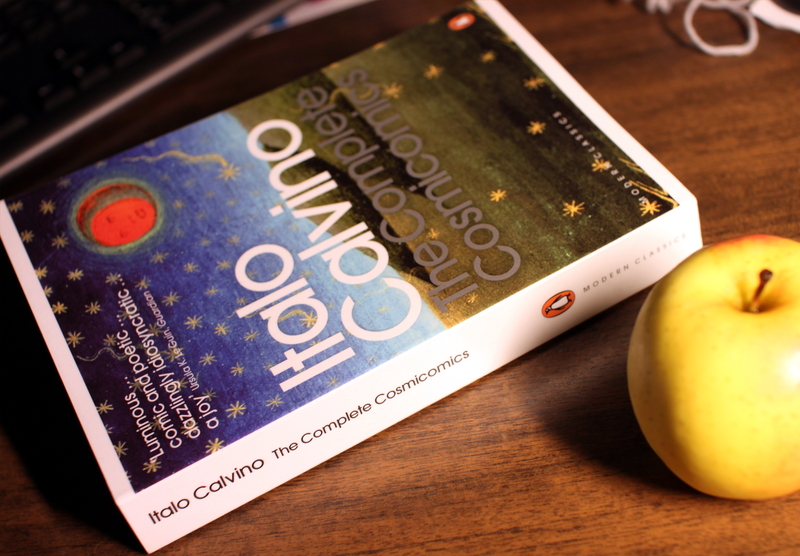 This entry was posted in Fiction and tagged book review, Italo Calvino, The Complete Cosmicomics. Bookmark the permalink.